Did you ever need to rearrange or reorganize columns across multiple sheets in a certain order based on column headers? In this article I’ll try to explain how to rearrange columns in Excel based on column header information by using Visual Basic for Applications (VBA) . As mentioned in the intro, this article is about rearranging columns in Excel using column header information. Address, City, Country, Date of Birth, First Name, Last Name, Middle Name, Phone Number, Postal (ZIP) Code, State. Someone sent me an alternative solution for reorganizing columns in Excel. The script makes use of the array function in Excel. It does a really nice job but beware, the code handles your data in a way that it does keep your original data structure. As I’m currently working a lot with Excel, I get a lot of questions like “How do I do this?” or “How do I do that?”. 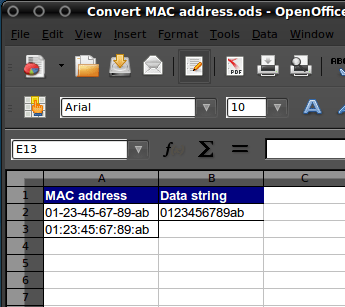 Yesterday someone asked me how to convert a data string to a MAC address. The standard format for printing MAC addresses in human-friendly form is six groups of two hexadecimal digits, separated by hyphens (-) or colons (:), in transmission order, e.g. 01-23-45-67-89-ab, 01:23:45:67:89:ab. 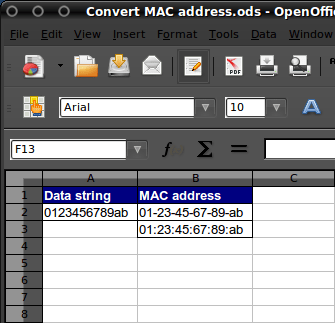 In this article I’ll give you examples of how to add, remove or change the separator for MAC addresses in MS Excel or OO Spreadsheet. 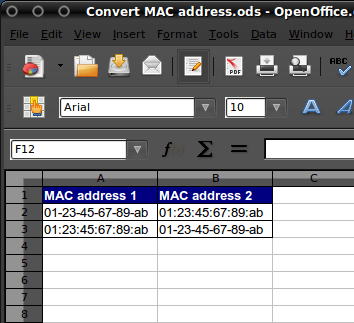 An alternate solution, to convert the Cisco 0123.4567.89ab MAC format to the F5 load balancer MAC format of 01:23:45:67:89:ab, was send in by Mike Wintrode. To add an extra twist, the F5 load balancer also removes the leading “0” in any pair, so for instance 00:14:0F:80:a3:01 would show as 0:14:f:80:a3:1. The basic premise utilizes an “IF” statement to check for a preceding “0” and if present to return the next character, and if not to return both characters. (thanks Adam! ), which you can download here.